Thank you to all the 2018 participants who made the 2018 auction such a success! Register today for the 2019 Fiddlehead Fling! Be a part of this year’s Fiddlehead Fling! Register for this year’s benefit auction. Your $100/person registration provides you with delicious hors d’oeuvres by Christophe Chef Services, dessert by King Arthur Flour, two complimentary beverages and a cash bar from Maple Street Catering. Arrive by 6:30 pm to enjoy a special sip of sparkling wine on us! If you cannot attend, you are invited to make a fully tax-deductible donation to Fund a Need. Visit our Auction Items page to view the 2019 auction catalog. Items donated to the Benefit Auction are tax-deductible according to the tax basis (not the fair market value). In general, if the total charitable deduction claimed for non-cash property exceeds $500, the taxpayer must file IRS Form 8283. For property valued at more than $5,000, a written appraisal may be required. For items and services purchased at the Benefit Auction, any amount paid that exceeds the fair market value may be tax-deductible. Reservation fees and raffle entries are not tax-deductible. Please consult your tax advisor for more details or advice. If you would like to donate an item to the auction, please call 802-649-2200 ext. 249 or email auction@montshire.org. A unique opportunity for elegance! 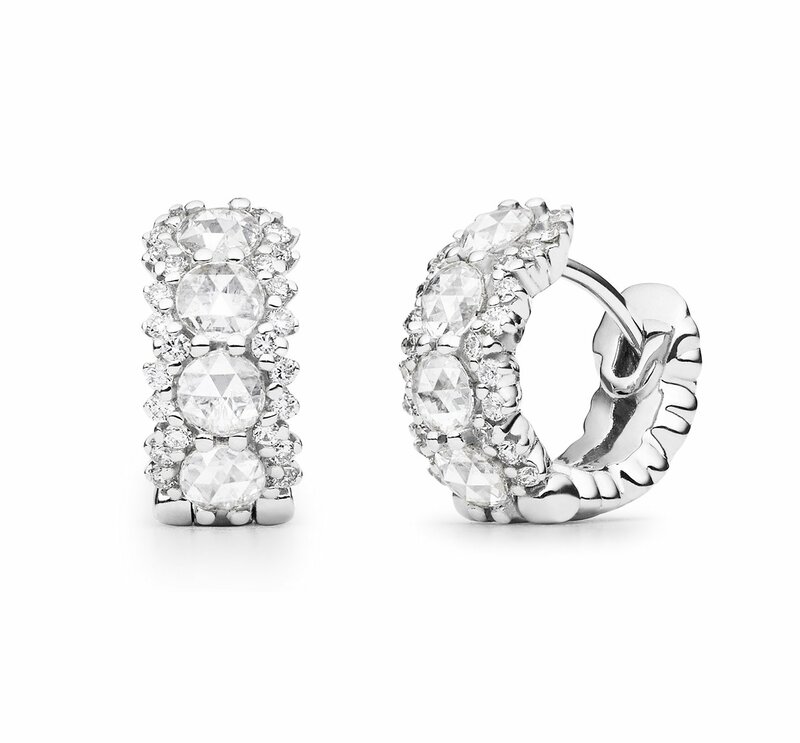 Courtesy of Von Bargen’s Jewelry, these beautiful rose-cut diamond snap hoops–designed and created by Paul Morelli–are 18 carat white gold with vintage style rose cut diamonds, accented by modern round brilliant cut diamonds. The diamonds together weigh 0.76 carats. Only 100 raffle entries will be sold. You need not be present to win. Fund a Need is a special component of the auction that allows you to make a donation in support of a specific community need. You can make a fully tax-deductible donation to Fund a Need right now. Click here to donate. Raise your paddle during the Live Auction to help the Montshire support rural teachers, schools, and communities throughout Vermont and New Hampshire through high-quality STEM programming. Outreach and teacher professional development programs are strengthening science education throughout our region! Fund a Need bidding starts at the highest amount. Then the auctioneer will ask for donations at subsequent lower amounts. ALL bids are accepted as donations. Guests will be able to fund specific community needs during the Silent Auction as well. Choose from among three components of the Warm Welcome program, which supports families with low incomes: scholarships, low-cost memberships, and free passes for local human service agencies. Learn more about this year’s Fund a Need. White Mountain Insurance Group, Inc.
Tyler, Simms & St. Sauveur CPAs, P.C.